John received his BA in Linguistics & Spanish from UCLA in 1989 and his MA in Teaching English as a Second Language, also from UCLA, in 1993. He worked in the Los Angeles Superior Court as a Spanish Interpreter from 1989-1999. He was granted a PhD from UCLA in Applied Linguistics in 1998. 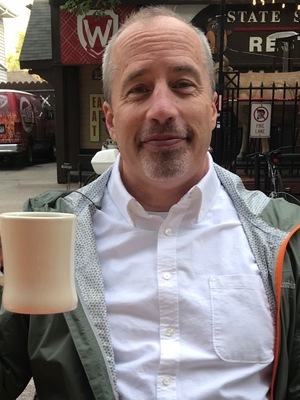 He taught language teaching methodology and supervised Spanish language courses in the teacher education program at the University of Northern Iowa from 1999-2004 and moved to OSU in 2004. He is an active member of OSU's Language Acquisition Discussion Group ("Lacqueys") and does research in Latin America. He co-directs the Spanish & Portuguese Department Language Acquisition Lab with Prof. Holly Nibert. His research focuses on developmental linguistics, including the syntax of child Spanish-speakers, especially tense marking in those diagnosed with specific language impairment (SLI). Other projects include research into developmental semantics-pragmatics, including children's knowledge of pragmatic implicatures and their interaction with prosody and children's comprehension of collective/distributive expressions. He teaches courses on introductory linguistics, language development and syntax in the Spanish & Portuguese Department and in the Linguistics Department. He was an Associate Editor of Language Acquisition: A Journal of Developmental Linguistics from 2008 to 2015. Please visit the Language Acquisition Lab of the Department of Spanish and Portuguese at The Ohio State University.